To simplify vMotion across CPU generations VMware has introduced Enhanced vMotion Compatibility (EVC). EVC automatically configures server CPUs with Intel FlexMigration or AMD-V Extended Migration technologies to be compatible with older servers. 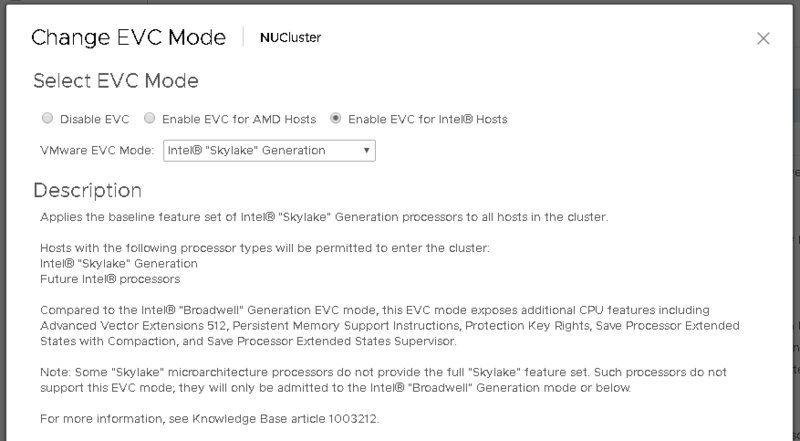 In vSphere 6.0, the "Intel Haswell Generation" EVC mode has been introduced. Intel uses a model named "Tick-Tock" to follow every microarchitectural change with a die shrink. This results in having two EVC baselines for every microarchitecture. I've created a small table with a quick overview about EVC Modes with their appropriate CPU Series and Codenames used by Intel to denote their CPUs. 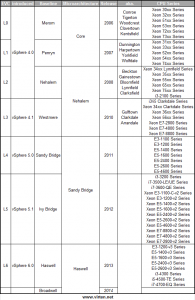 I've also included additional Codenames that may be used by Intel for special processors. The upcoming Haswell architecture is named, but not yet available or supported by VMware.